Location: 14100 North 32nd Street, Phoenix, AZ 85032. The school day begins at 8:15am and will end at 3:25pm. Full uniform is required for all students. Parents and students, please be aware that students should be in their classrooms at 8:10am, so instruction can begin promptly at 8:15am. Please take some time to review our traffic flow map. This new pattern will take some time for our community to learn & practice. It will be a far more vehicular experience than what we’re used to. Thanks in advance to everyone for your patience & diligence in learning the new procedures well ahead of time. We rarely send papers home. Please keep abreast of all school events and news by checking the website and calendar regularly. Please note that, email is the best method of contact when voicing questions or concerns. Occasionally the school sends out emails, text messages and phone calls from SchoolMessenger. Messages sent through this service can end up in some spam-boxes. Text messaging is opt-in only. It is very important to OPT-IN so you receive emergency messages. Please read the Family Handbook. Download a copy for your records. Download and print a copy of the Signature Page and return to school. Please take a moment to read the Honor Code with your student. 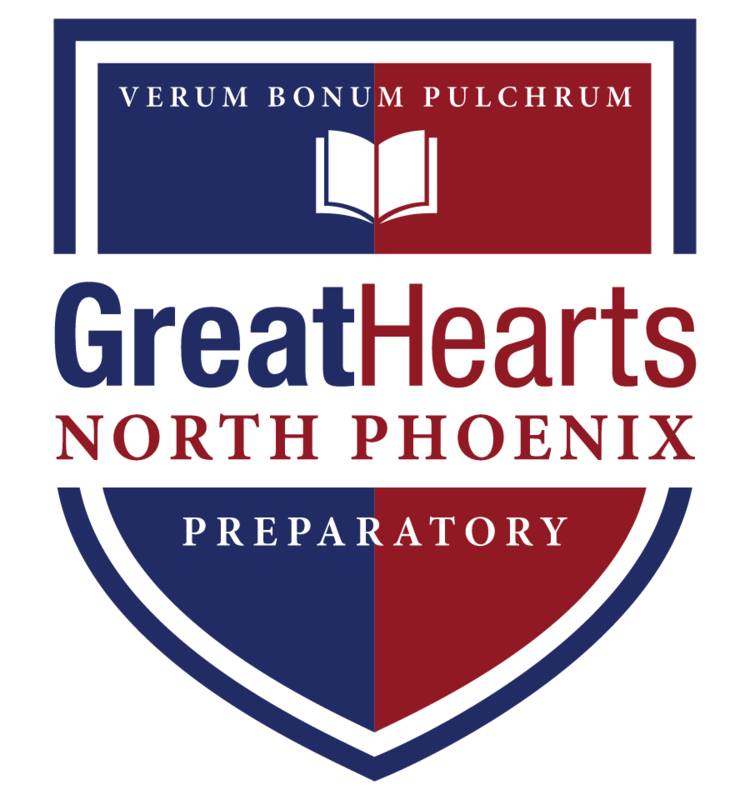 It is extremely important for each of you to understand the Great Hearts North Phoenix Prep code of conduct. Please contact the PSO or visit npxparents.org for information about ordering lunches, used uniforms, and volunteer opportunities. Your child’s class will utilize classic works of literature during the upcoming school year. These books are required in some of our classes. At Great Hearts Academies, it has always been the tradition for students to develop a personal library of books that they mark in, keep and return to during their time at Great Hearts, and treasure for years to come. We call these books “Classics to Keep.” Your child’s class will utilize these classics during the upcoming school year. Parents and students are strongly encouraged to purchase these books for their own personal collections, so that they can mark them and keep them, allowing students to develop their own impressive personal library of classics over the course of their academic career with Great Hearts. For families who do not purchase the texts, their student will be given access to a copy of these books as part of their curriculum. Students should not mark in Great Hearts provided books and will be asked to return the books in good condition once their class has finished with the book. Please make sure you acquire the exact ISBN on the list. This is most important when the students are reading texts translated from another language into English. North Phoenix Prep faculty create supplemental materials for certain courses. As with our Classics to Keep books, we strongly encourage families to purchase these workbooks, which are essential for some of our classes. Once purchased, these materials will then be distributed to the students at school. We have streamlined the process for obtaining these materials which include planners, school-published workbooks, fine art supplies, and fees for college preparation testing. In previous years, making these purchases involved long wait lines and multiple purchases from different sources. Now you can do it all online using Configio, and we will distribute the materials at school. Easy! Please click here to ensure that your students have everything they need for the first day of school. Be sure to choose Middle School or High School Family Contribution according to your student’s grade level. View and print the Supply List – please note additional items might be added by teachers during the first weeks of school. The school provides locks for student use. PLEASE DO NOT PURCHASE A LOCK FOR YOUR CHILD. HE/SHE WILL ONLY BE PERMITTED TO USE THE LOCKS PROVIDED BY THE SCHOOL. Students will receive their textbooks the first day of school. Textbooks must be covered – no exceptions. Book covers may be cloth or paper. Please read the Uniform Dress Code for 2018-2019. If the cost of books, supplies or uniforms presents a financial hardship for your family, please contact the school office. All volunteers must have a fingerprint card on file with the school office. Great Hearts performs a fingerprint screening free of charge to all volunteers. Information regarding fingerprinting events will be shared as they are scheduled. Per AIA stipulations, your child must have a yearly physical in order to play a sport at NPX. The physical must be dated after March 2018. Please complete and return the AIA Physical Form to our Athletic Director, Joe Page. Please remember to get new prescriptions for any expired medications such as EpiPens and inhalers for the upcoming school year. Summer is a great time to schedule annual visits with pediatricians to go over immunizations, refill prescriptions, and even have the AIA physical forms completed as it is required for all sports participation.